All products included in the offer will have a minimum shelf life of one year, which is same as the product(s) available in INGRID MILLET branches. 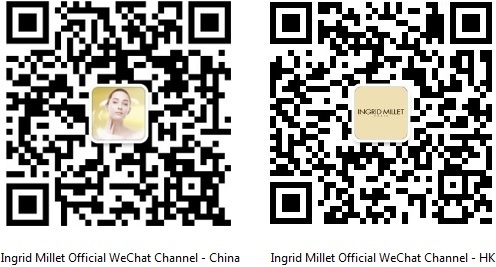 Promotional Trial offers offered on ingridmillet.com.hk have a validity period of 60 days from the date of purchase. All product(s) purchased from this website will be delivered to your registered mailing address by INGRID MILLET designated courier company from 3 to 5 working days (Working day: Monday to Friday), exclusively for public holidays and bad weather condition. Our designated Courier Company will endeavor to provide delivery service rapidly and efficient. But the delivery time will be affected by weather and public holidays or festivals (for example: Christmas, Chinese Lunar New Year). Courier Company is not binding the delivery schedule, and Courier Company and INGRID MILLET LTD. will not bear any legal responsibility due any damage or loss caused by delay. Offer(s) (remark 1) purchased from ingridmillet.com.hk are not refundable or exchangeable. All online treatment promotions as shown on ingridmillet.com.hk are valid for new customers only; and each new customer can enjoy the treatment offer once only. Unless it’s specified for existing customers. Any request of modification or cancellation of appointment must be informed to the selected INGRID MILLET branch 6 hours in advance. This promotional offer cannot be used in conjunction with other discount(s) or promotional offer(s), no matter in any INGRID MILLET branches or ingridmillet.com.hk. In case of any disputes, INGRID MILLET LTD. reserves the right of final decision. Remark 1: Offer implies both the selected treatment and/or product. 2. No exchange for damaged or used merchandise. Ingrid Millet Limited reserves the right to determine whether the merchandise has been damaged or used. 5. We require 6 hours cancellation notice prior to the customer’s scheduled arrival, otherwise, Ingrid Millet Limited reserves the right to charge the full treatment cost accordingly. 6. Ingrid Millet Limited reserves the right to change the schedule and timetable of all workshops or activities. 8. Please take care of your personal belongings when enjoying treatment. Ingrid Millet Limited is not responsible for any lost or missing item. 9. Bringing baby or child to the shop is not recommended when enjoying treatment. Please take care of baby or child if the Customer must bring them along to the shop. Ingrid Millet Limited is not responsible for any matter that would arise should any accident happen. 10. If customer is pregnant or has any other health matter, please inform the staff at the shop before enjoying treatment. Ingrid Millet Limited is not responsible for any health or side effect issue of the customer while performing treatment. 11. In order to avoid disturbing other customers while enjoying their treatments, Ingrid Millet Limited may cancel the appointment if the customer arrives late due to personal reason. 12. All sales terms are to follow that listed on the Sales Memo. Ingrid Millet Limited only acknowledges and accepts the commitments which are listed on the Sales Memo. The term 'INGRID MILLET' or 'us' or 'we' refers to the owner and operator of the website whose registered office is 6th Floor, Casey Building, 38 Lok Ku Road, Hong Kong. The term 'you' refers to the user or viewer of our website. Every effort is made to keep the website up and running smoothly. However, we take no responsibility for, and will not be liable for, the website being temporarily unavailable due to reasons of any kind. We and other parties own the trademarks, logos and service marks displayed on this website. These shall not be used without the written permission of us or the party owning these. Materials on this site are protected by copyright. No part of these materials may be modified, reproduced, stored in a retrieval system, transmitted, copied, distributed or used in any other way for commercial or public purposes without our prior written consent. You may not create a link to this website from another website or document for commercial use, without our prior written consent. Your use of this website and any dispute arising out of such use of the website is subject to the laws of the Hong Kong Special Administrative Region of The People's Republic of China. We own and operate www.ingridmillet.com, www.bioscreen-paris.com, www.hkmedical.com. If you would have queries about this policy, please write to us at 6th Floor, Casey Building, 38 Lok Ku Road, Hong Kong or email us at cs@ingridmillet.com.hk. We reserve the rights to change the terms and conditions as contained herein from time to time without prior notice.